OCL were awarded two work packages at this particular location. The first was the installation of bespoke CMS along the underside of the platform nosing to supply a route for the new ATC cabling that would allow the new stock trains guided by sensors to stop and open there doors at the exact location as required on the associated platforms. This particular package also included the installation of other associated CMS and the installation of Anderton supplied concrete c.1.7 troughing and concrete encased ducting. The installation methodology for the platform works required precise and bespoke fabrication due to the AOC requirements and the working time constraints with this particular location being at the end of the District Line. 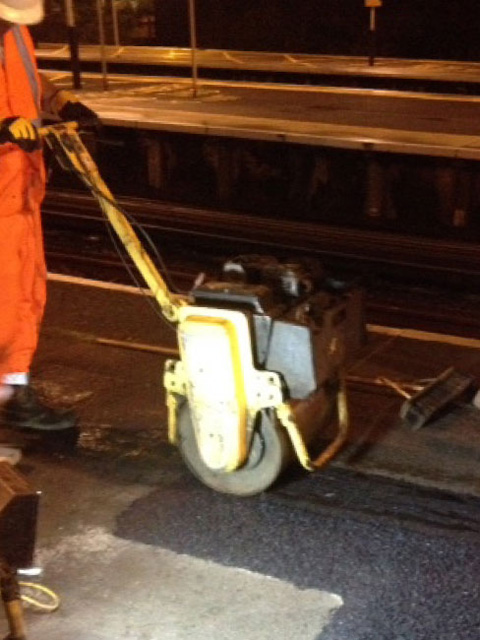 The second project required OCL‘s experienced resurfacing personnel to extend both platform surfaces on platforms 1 & 2. The extension was due to the length of the new longer carriages, which form the new ‘S’ stock trains. OCL were required to provide competent personnel to extend the platform surfaces whilst incorporating and upgrading all associated drainage and catch pits within the platform areas. This enabled the new tarmac surface to be made safe for the public to access and the drivers to exit their cabins. Careful planning was required for both projects, with both Network Rail and London Underground project teams collaboratively arranging works communication and access. OCL personnel were certified to both London Underground and PTS certification to carry out these works which was completed on time and to budget.